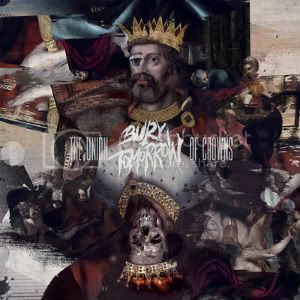 ‘The Union Of Crowns’ is the second full-length album from Southampton metalcore outfit, Bury Tomorrow. Slowly building up from a catchy guitar intro, opening track ‘Redeemer’ sets the tone for the rest of the album and bursting into its prime with Dani Winter-Bates‘ guttural roars, which is already a step aside from the traditional metalcore high-pitched screaming. Jason Cameron‘s clean vocals provide depth and variety to the album and make for sing-alongs of epic proportions, specifically in tracks such as ‘Lionheart’, ‘Royal Blood’ and ‘Message To A King’. Whilst mainly sticking to the formula that they know and are good at, Bury Tomorrow do make solid attempts at deviating from the norm throughout ‘The Union Of Crowns’. This is especially evident on album closer ‘A Curse’, which features no harsh vocals from Dani at all. Instead, it begins with a simple guitar riff, building to Jason‘s clean vocals which he showcases wonderfully throughout the album and climaxing with one of the album’s most intense, powerful guitar solos. The three singles that were released prior to the album (‘Lionheart’, ‘Royal Blood’ and ‘An Honourable Reign’) are noted in the album as tracks we’re familiar with, but they’re by no means the best tracks featured, which is usually the case with single releases. Rather, ‘Message To A King’ is one of the strongest tracks on the album, featuring quite honestly some of the most catchy choruses and infectious riffs that you’ll hear this year. Bury Tomorrow have definitely shown that they can step up the pace with ‘The Union Of Crowns’, but they haven’t shown much in terms of deviating from their set writing processes. The standard metalcore harsh vocal verse, clean vocal chorus is overused throughout the album, but the imagination exists to ensure that this is barely noticeable. Perhaps the only reason it’s overused is because the album consists of a massive fourteen tracks, all of which are as notable as one another in terms of quality. In terms of development from their previous album, ‘Portraits’, Bury Tomorrow have nailed it. This album is much more mature, more memorable, easier to find yourself listening to over and over (and over again). Dani‘s voice seems to have matured and despite the waiting period between the two albums, the tracks we’ve seen live still transpire excellently. A solid effort from one of the UK’s most notorious metalcore bands. NEWS: …And You Will Know Us By The Trail Of Dead announce October UK tour! NEWS: Architects announce November headline UK tour!